Reflecting on a scathing inspection in 2015 that declared HMP Maghaberry to be “unsafe and unstable”, new governor David Kennedy talks to David Whelan about the significant progress that has been made in recent years within the largest of Northern Ireland’s three prisons. An unannounced inspection in late 2018 pointed to “significant progress” being made to improve the high-security prison in Lisburn, which houses almost 800 long-term and on remand prisoners. The report paid tribute to staff and senior management for the achievements made in the context of the earlier report, following which Her Majesty’s Chief Inspector of Prisons in England and Wales, Nick Hardwick stated that Maghaberry was one of the worst and most dangerous prisons he had ever been to. Spearheading that progress, David Kennedy officially took up the post in February 2018 having served as deputy governor under Stephen Davis, his friend and colleague who prematurely passed away in 2017 after a short illness. Kennedy explains that ensuring that the transformational vision installed by the senior management team, both of whom took up post following the damning 2015 inspection, was enacted, was a key factor in his taking up of the post. Although recently returned to Maghaberry, Kennedy is no stranger to the prison, which he describes as a “second home” having spent close to two thirds of his 30 plus year career at the prison in a variety of roles. Having entered the Northern Ireland Prison Service (NIPS) at officer level and worked his way up through the ranks, Kennedy is proud of his journey and believes his experience and understanding equips him well for the job at hand. That job, he admits, was seismic. A 2012 inspection report had indicated green shoots of recovery for the prison but by 2015 Maghaberry had taken “a step backward”. serious problems with medication administration. Quizzed on what changes enabled the latest inspection report to declare Maghaberry “a different place” Kennedy points to a focus on two key areas. The first was around delivering a daily routine on a consistent basis which facilitates purposeful activity, whilst the second was around contraband prevention. Addressing the changes, Kennedy says: “We have a published core day which varies from area to area and delivers our morning, afternoon and association routine. That previously wasn’t being delivered effectively and very quickly after taking up post we set about changing that. 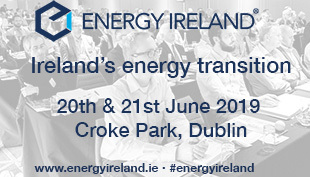 “We achieved this pretty early and over that first year we had a core day being delivered as efficiently as I have ever seen it. Kennedy emphasises a personal pleasure in witnessing the uptake by prisoners in taking advantages of those purposeful activities. However, he is keen to emphasise that change has emerged wider than just getting prisoners out to work and activities. The 2015 inspection report found that “levels of assaults and rates of self-harm at Maghaberry Prison had increased and inspectors were told a great deal of bullying and incidents of physical violence were going unreported”, while at the same time “illegal and prescription drugs were also more widely available than in March 2012”. Commenting on progress highlighted in the most recent inspection, Kennedy admits that the senior management team has not been afraid to take hard decisions. One such decision was the re-introduction of staff patrolling of yard and recreational areas, a process that had been abandoned for many years. The critical 2015 report identified “no go areas in the prison” and Kennedy highlights that re-introducing these patrols was initiated early in his tenure. “We ensured that there were no ‘no-go areas’ at the earliest possible juncture in early 2015 and by 2016 every integrated residential area had staff patrolling recreational rooms and yards. Kennedy emphasises that ensuring a consistent core day and a safer and more respectful prison were key to enabling change within the prison and also enabling the growth of purposeful activity. Outlining that the prison continues to grow its offering alongside key partners such as Belfast Met, he has set a target for staff of getting 400 prisoners involved in purposeful activity in the mornings and 300 in the afternoons. These targets do not include, but acknowledge, activity ongoing ‘in-house’. Consistently hitting these targets has been a collaborative and successful approach. “Our staff and our partner agencies have excelled in ensuring we can make a difference to individuals in our care. There is a realisation that our work entails not just offering activity but also facilitating prisoners to recognise the opportunity to do something meaningful,” he says. Kennedy highlights that as well as core education provision such as literacy and skills, NIPS are keen to seize on opportunities as they arise. A prime example of the work ongoing is the success of the prison’s Riverside Café, a facility staffed by prisoners which serves as the prison’s kitchen, delivering up to 3,000 meals per day, but also prison staff and visitors. The Café integrates prisoners who are undertaking learning and skills programmes in cookery and provides a space for their practical work necessary to attain qualifications. However, it’s not the only example. Recently Maghaberry opened up a barbershop, giving prisoners new accredited skills and offering greater potential for prisoners to get jobs upon release. Other successful accredited skills initiatives centre on areas such as cleaning, joinery, sport and even recycling. Landings in the new Davis House. 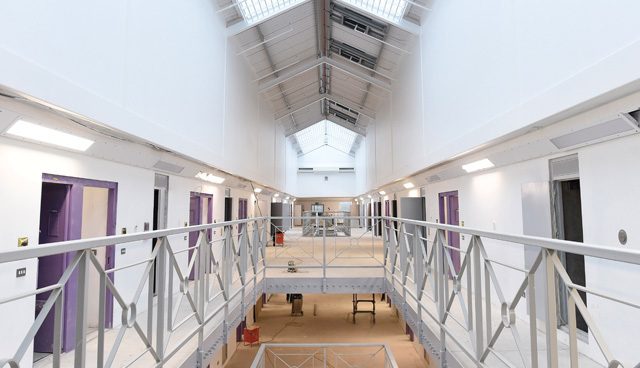 The progression of the prison is in some way reflected in the creation of a new 360 cell accommodation block, expected to be opened on a gradual basis from autumn 2019. The new block will replace four square house accommodations, which date around 35 years. 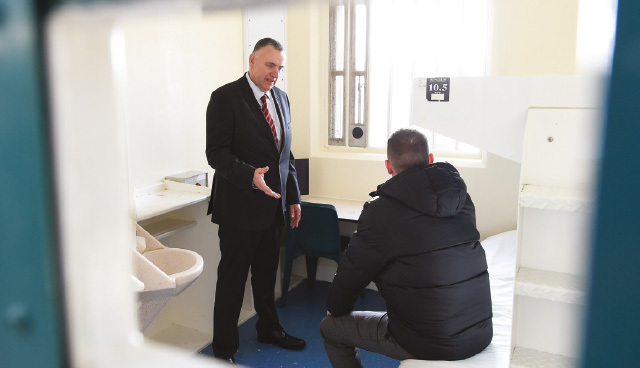 The governor explains that provisions within the new block are well-matched with the prison’s ambitions of gradual improvements including the likes of bigger cells, wider landings, individual wet rooms and toilets and modern technology, whilst also housing additional facilities for learning and skills and healthcare provision. While proud of the positive changes within the prison, Kennedy outlines a desire to constantly push targets and ambitions. He believes that this desire is being effectively supported by an over-arching strategy. The draft Programme for Government and the Prisons 2020 document has for the first time provided a strategic roadmap and outlines concisely where the NIPS fits into the wider justice family. This, he states, has better equipped staff, prisoners and family to recognise the potential that work inside the prison’s walls can have in terms of contributing to wider society. While the majority of the recent inspection report was positive, inspectors noted their remaining concern that work to support the most vulnerable men at Maghaberry had not developed to the same level as other aspects of safety. Speaking about mental health provision within the prison, Kennedy outlines his understanding that as mental health complexities in society grow, this will be reflected in the prison population. For this reason he says that NIPS, alongside their partners in the South Eastern Health and Social Care Trust, are constantly looking at new and better ways to do things. 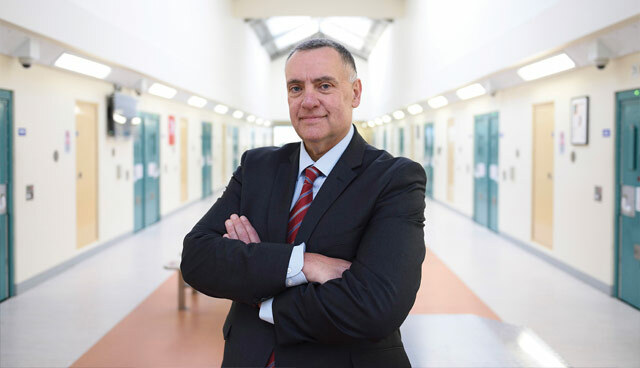 He believes that the ongoing work to create a safe, decent and respectful prison, which offers as many opportunities as possible will help create an environment that is both conducive to better mental health and enables staff to better work and support individuals. In terms of systems, he points to an ongoing review of the Supporting Prisoners At Risk (SPAR) programme, a joint process with the Trust, as processes designed to ensure safety of vulnerable prisoners, whilst also indicating additional services which have been integrated such as Samaritan-trained prisoner mentors, available to act as a listener to prisoners on request. Looking ahead Kennedy says that continuous improvement is more valuable to him than setting out any milestones to reach. “We have come a long way in recent years and if we can continue at that pace for the coming years then we will have made significant progress.